WASHINGTON, DC (March 28, 2018)–Dining out more at restaurants, cafeterias and fast-food outlets may boost total levels of potentially health-harming chemicals called phthalates in the body, according to a study out today. Phthalates, a group of chemicals used in food packaging and processing materials, are known to disrupt hormones in humans and are linked to a long list of health problems. The study is the first to compare phthalate exposures in people who reported dining out to those more likely to enjoy home-cooked meals. People who reported consuming more restaurant, fast food and cafeteria meals had phthalate levels that were nearly 35 percent higher than people who reported eating food mostly purchased at the grocery store, according to the study. "This study suggests food prepared at home is less likely to contain high levels of phthalates, chemicals linked to fertility problems, pregnancy complications and other health issues," says senior author Ami Zota, ScD, MS, an assistant professor of environmental and occupational health at Milken Institute School of Public Health (Milken Institute SPH) at the George Washington University. "Our findings suggest that dining out may be an important, and previously under-recognized source of exposure to phthalates for the U.S. population." Lead author Julia Varshavsky, PhD, MPH, at the University of California, Berkeley, School of Public Health, Zota, and their colleagues used data from the National Health and Nutrition Examination Survey (NHANES) collected between 2005 and 2014. The 10,253 participants in the study were asked to recall what they ate and where their food came from in the previous 24 hours. The researchers then analyzed the links between what people ate and the levels of phthalate break-down products found in each participant's urine sample. 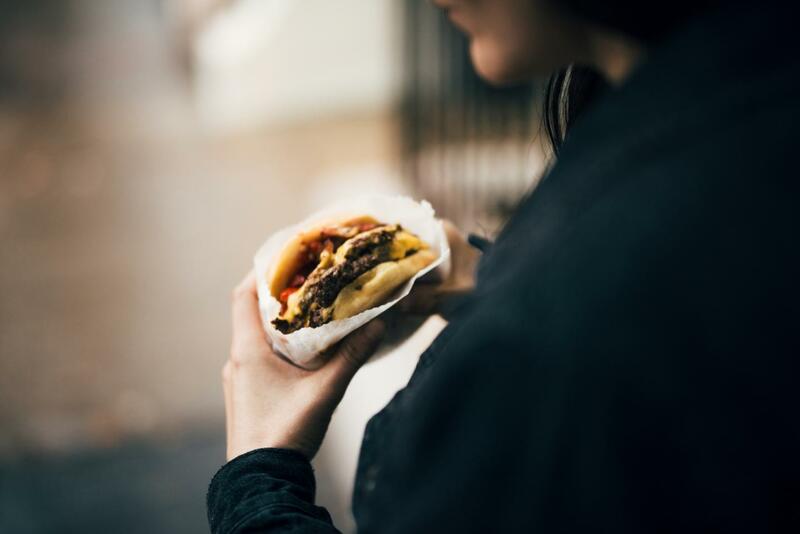 Certain foods, and especially cheeseburgers and other sandwiches, were associated with increased levels of phthalates–but only if they were purchased at a fast-food outlet, restaurant or cafeteria. The study found that sandwiches consumed at fast food outlets, restaurants or cafeterias were associated with 30 percent higher phthalate levels in all age groups. "Pregnant women, children and teens are more vulnerable to the toxic effects of hormone-disrupting chemicals, so it's important to find ways to limit their exposures," says Varshavsky, who is also a postdoctoral scientist at the University of California, San Francisco. "Future studies should investigate the most effective interventions to remove phthalates from the food supply." The new study looked more broadly at dining out–not just at fast-food outlets–and found that it was significantly associated with increased exposure to phthalates. The authors say the findings are worrisome because two-thirds of the U.S. population eats at least some food outside the home daily. Additional authors of the study include Rachel Morello-Frosch at the University of California, Berkeley, and Tracey Woodruff at the University of California, San Francisco. The team used an innovative method of assessing real-world exposures to multiple phthalates, called cumulative phthalate exposure, which takes into account evidence that some phthalates are more toxic than others. The National Academies of Sciences has weighed in twice on phthalates–first in a 2008 report, they recommended using cumulative risk assessments in order to estimate the human health risk posed by this class of chemicals; and then in 2017 with a report finding that certain phthalates are presumed to be reproductive hazards to humans. Many products contain phthalates, including take-home boxes, gloves used in handling food, food processing equipment and other items used in the production of restaurant, cafeteria and fast food meals. Previous research suggests these chemicals can leach from plastic containers or wrapping into food. If verified by additional research, the findings from this study suggest that people who love dining out are getting a side of phthalates with their entrée. Home-cooked meals may be one way to limit exposure to these harmful chemicals. "Preparing food at home may represent a win-win for consumers," adds Zota. "Home cooked meals can be a good way to reduce sugar, unhealthy fats and salt. And this study suggests it may not have as many harmful phthalates as a restaurant meal." At the same time, phthalate contamination of the food supply also represents a larger public health problem, one that must be addressed by policymakers. Zota and Woodruff's previous research shows that policy actions, such as bans, can help reduce human exposure to harmful phthalates. The study, "Dietary sources of cumulative phthalates exposure among the U.S. general population in NHANES 2005-2014," appears online March 28 in the scientific journal Environment International. The U.S. Environmental Protection Agency, the National Science Foundation, the National Institute of Environmental Health Sciences and the Passport Foundation provided funding for the study.